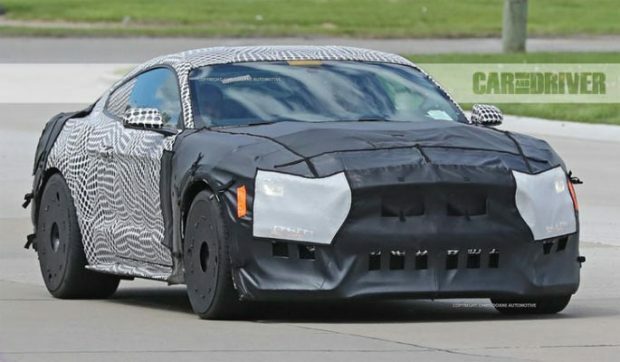 The 2018 Ford Mustang Shelby GT500 looks like it’s inching forward closer to the production line with recent images spotted out in the wild. The car is planted with most powerful Shelby has yet with new design features and hoping to be hot on the heels of the competition from Dodge and Chevrolet. The Dodge Challenger SRT Demon which was recently unveiled, topped the horsepower wars at 850 HP and a Camaro ZL1 with 650hp seem to be heading the charge and horsepower wars with an obvious absence from Ford and the Mustang. the GT 500 will hit the roads with a new styling is shown from the spy shots captured by car and driver. The GT 500 is styling updates seem to include huge air intakes with the newly design, front-end, probably following the Shelby GT350 in some respects, large events behind each of the front wheels and a redeveloped rear diffuser. there is nothing official has yet as to what will power the upcoming GT 500, but it may be a variation on the 5.2-liter Voodoo V8 with a 90° crankshaft and possible supercharger. The previous version made 662 hp, so is more than expected that the 2018 version will be making in the region of 700 HP, through our potential, 10 speed automatic or six speed manual transmission. Anyway you look at it, the new GT500 is going to be the most powerful best optimized as yet. Next Story → Chevrolet Camaro SS Drag Race Development Program To Match The Demon?